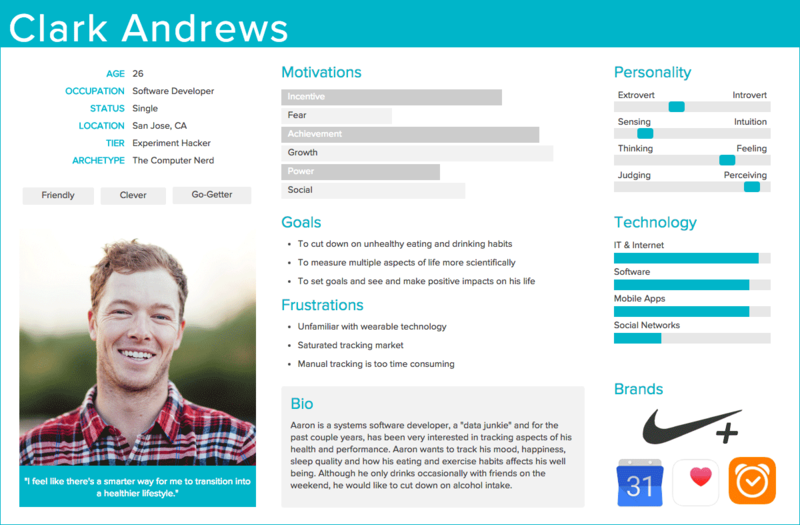 I’m not a fan of personas as design tools. Not one’s based on demographics anyway. Demographics don’t help me design. Knowing gender, age and the size of someone’s house doesn’t tell me how to shape a service. I prefer personas that strip out demographic information and focus on what they do, their goals, behaviours, and how we must support them. But these personas still tend to have photos of people happily staring into the distance. Probably thinking about how your service has changed their lives for the better. Using photos is misleading. We should use drawings instead. Here’s why. Look at this typical persona photo. Why did they use a photo of a young white male who hangs out in fields wearing lumberjack shirts? Do all users that fit into that persona look like this? Personas shouldn’t be about how people look, but what they do. Cartoons allow you to strip out unnecessary stuff and focus on what the persona is doing or how they are feeling. 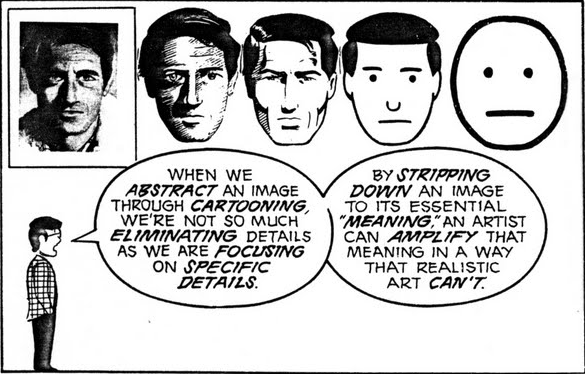 Again, Scott McCloud puts it well. Take these examples, there is still some demographic information, but the focus is less on looks, and more on emotions. However you can remove all age race and gender and still get across how a character is feeling. We are representing their attitude, not their appearance. But can you empathise with an abstract shape? Yes. Watch any pixar film. Anyway we don’t need to empathise with what a person looks like, but empathise with their situation. Most persona images don’t communicate anything helpful. Drawings can. They give you complete control of the subject, how they are feeling and their environment. 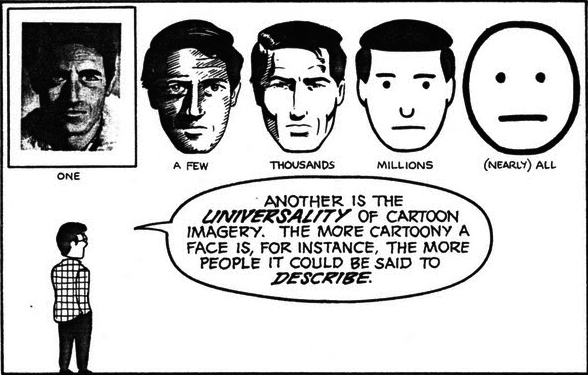 Think of your persona image a single panel comic. How can you get across the story of what their goal is? In this picture, it’s not important that it’s a woman, or that she has a family. But that her family is using devices and she’s worried about them. In this picture is not important that it’s a white dude. It’s that they have a lot of tech, someone is asking them to fix something that’s broken and he’s not happy about it. Can you communicate scenarios with abstract shapes? Yes, better than a random headshot. Let’s use the example of a persona for a supermarket. Which of these images tells you more about the persona’s shopping goals and attitude? Also, remember the Bupa ads from a few years back? They told really effective stories about their service with shapes, not people. But a photo can represent a situation.. Yes, but you’ll spend ages searching for a photo that fits. You’ll probably give up and just use a picture of a women laughing alone with salad. By that time you could&apos;ve drawn a picture ten times over. What if I can’t draw? You can draw. Shut up. Keep is simple. It doesn’t have to be a masterpiece as long as it communicates something. Shapes with faces could be enough. Practice. There are loads of resources for getting more confident. Drawing books by Ed Emberly are great at showing how to communicate really simply through drawing. Use this free UX comic library that will help you create rough comics or characters to use in stuff like this. It’s not perfect but it helps you get started. Don’t use an image. If it doesn’t add anything, why add it? TL:DR; Persona images are rubbish. 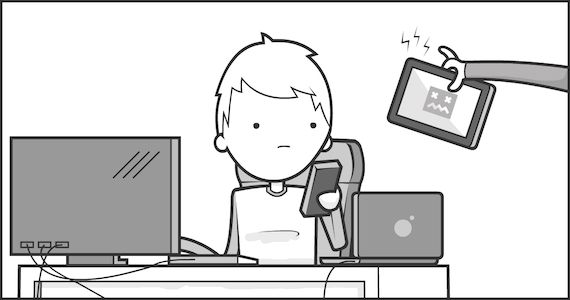 Use a single panel comic to explain the persona’s situation. Make it abstract so it applies to a wider user group.